There is tremendous uncertainty in the privacy rights regulatory environment today. 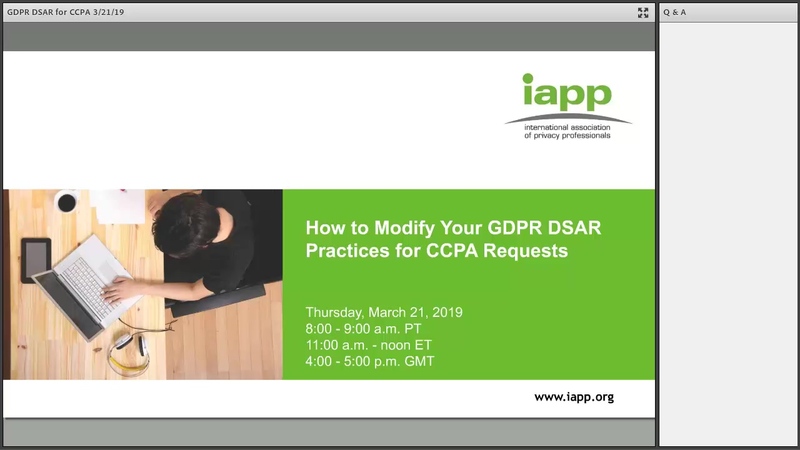 The most prominent regulations – GDPR and CCPA – have significant differences. They’re going to continue to change. And new regulations will continue to emerge. Yet with GDPR in full effect, the “wait and see” approach is not an option. What is: a privacy rights management solution that’s future proof against the uncertainty. While GDPR may have been somewhat of a blueprint for CCPA, the regulations have important differences. Some are small, some are major, and some are diametrically opposed. All magnify the uncertainty of today’s privacy rights regulatory environment. Even with existing regulations like the GDPR and the CCPA, there is broad consensus that regulators are only just getting started and that how the laws are interpreted will be decided over time … and in the courts. 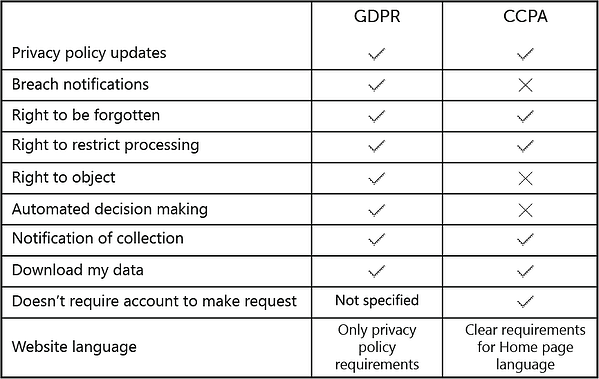 GDPR v. CCPA: Some differences are small, some are major, and some are diametrically opposed. All magnify the uncertainty of today’s privacy rights regulatory environment. All 28 of the EU member countries are required to pass their own privacy implementation legislation, in which they define local exceptions to GDPR rules (for example categorizing data about ethnic origin, religious beliefs, health, and sexual orientation). Since GDPR was passed, at least 10 other countries – including Argentina, Australia, and Brazil –have moved to implement similar rules. In response to the CCPA and in an attempt to avoid a patchwork quilt of legislation across all 50 states, a group of 15 U.S. senators introduced the Data Care Act in December 2018. If passed, it would be the first law to address privacy on a federal level. In an environment in which the only certainty is uncertainty, there is huge risk in implementing an inflexible solution that only suits today’s regulations. The risk applies whether you’re looking to build your own privacy right management system, subscribe to a SaaS solution, or adapt an off-the-shelf workflow management tool. In an environment in which the only certainty is uncertainty, there is huge risk in implementing an inflexible solution that only suits today’s regulations. In a world of change, the individual will be constant in any discussion of privacy rights. But so will the company. It’s important to enable end users to exercise their data privacy rights without overburdening the business – without over-tasking your team, or your budget. If you set up your technology plans with some resource buffer and flexibility, including capital and headcount, you can better weather the variations and changes that are inevitably coming. Certainly there are some companies for whom building and maintaining a privacy rights management solution in-house makes the most sense. But there are reasons to turn to an as-a-service solution: Speed, cost, scalability. And, flexibility. The solution provider stays up-to-date with changing privacy regulations and updates the solution accordingly. A software-as-a-service privacy rights management solution enables speed, lower cost, scalability. And flexibility: a must in an environment of regulatory uncertainty. If you modify a generic workflow management tool or build your own system, be sure to budget research, development, and implementation time to alter the system as regulations change. A future proof solution is one that gives you the confidence of superior performance today, while helping you be prepared for changes that are impossible to predict. Future proofing in an environment where change is the only certainty. Proactive data privacy protection as a competitive advantage.